A-1 Well Drilling can have your well drilled in an afternoon. 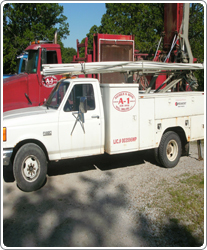 Since 1952 A-1 Well Drilling has been serving the Tri-Lakes area offering complete water well drilling services. From water well systems to minor repairs, A-1 Well Drilling offers the same courteous and professional service to all customers. A-1 Well Drilling provides quality products to ensure that you receive the best value for your money. The company is also licensed to install septic systems making A-1 Well Drilling capable of providing comprehensive service from start to finish. Contact A-1 Well Drilling today for your free estimate. A-1 Well Drilling will provide an on-site evaluation to help determine your needs.